Hojo Undo is the Japanese term used for the conditioning exercises of martial arts. For this, various instruments are designed. Traditionally, These instruments are composed of materials that were available when they began to be used, as wood, stone and iron, although, at present, other materials may be used. Some can even be done at home. Weight, generally cement, end with wood (ou metal). The Chi'shi segurando uses up to end, and performing a series of movements and positions used in kata or kumite. 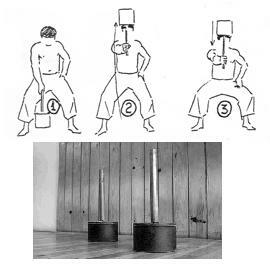 The weight strengthens the fingers, hands , arms, trunk and Pernas, for maintaining the position. Deve-be, entanto not, maintaining a posture so as not to cause damage to the spinal column. Clay pots filled with sand. 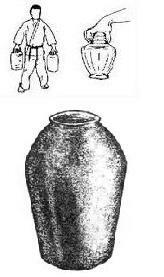 The practitioner must hold the vessel through the rim and run a series of movements and positions, similar to what acontecce with chi'shi. 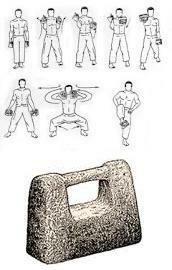 Weights, traditionally pedra, with handle. 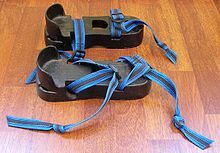 Are used in the practice of movements and kicks. 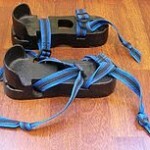 The extra weight helps strengthen the leg muscles. Oval iron ring which may vary in weight and size. 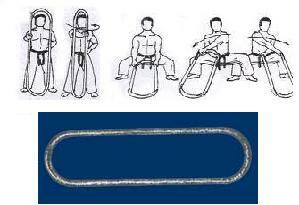 Traditionally used by fighters of Hawaii, was adopted by the Hojo undo Sensei Chogun Myiagi. Strengthens the wrists, arms, Pernas and trunk. Wooden pole bolted to the ground, with the top-coated cord. Intended to practice strokes with hands and kicks. Container with areia (or arroz) used to condition the fingers.